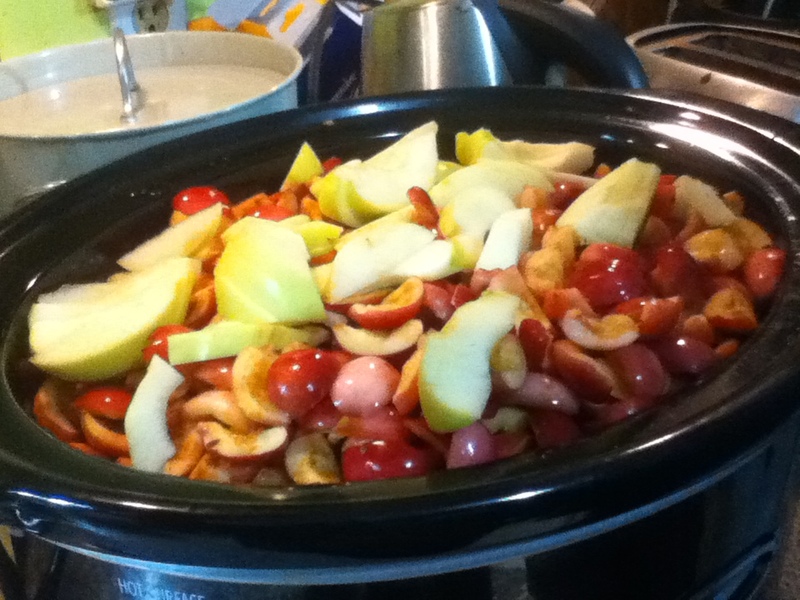 Crabapple Butter | Food It Yourself! It’s been a great season for apples here in the Bay State. It’s also been a great season for crabapples. If you are not familiar with this wild child of the Malus species check out this great PDF from Ohio State University. http://plantfacts.osu.edu/pdf/0247-721.pdf Yes, you can occasionally find these tart little apples in specialty markets, but for a true DIYet experience I recommend scanning your local landscape for a tree from which you can forage. You know the foraging rules, right? Make sure you have identified the tree correctly, and that you are not trespassing…yeah, you get it. There are a number of accessible crabapple trees in my area. There is only one tree that I forage from, however, as the rest are encircled by vast groves of poison ivy. Just one more thing you should consider when foraging. So what can you do with your found crabapples? Anything you would do with apples which requires cooking. Crabapples tend to be dry and quite “astringent” (the nice word for “bitter”) off the tree. When cooked they are far more complex than any cultured apple I’ve ever tried and the bitterness is reduced dramatically. Step one: wash those apples! I soaked them in the sink with a little vinegar and salt to get all the dust, dirt, and bugs. Yes, bugs. That’s what happens when you’re cooking with nature. I left the peels on for color, but the cores had to go. The easiest way to remove them- quarter the fruits and scoop out the core and seeds with a melon baler. 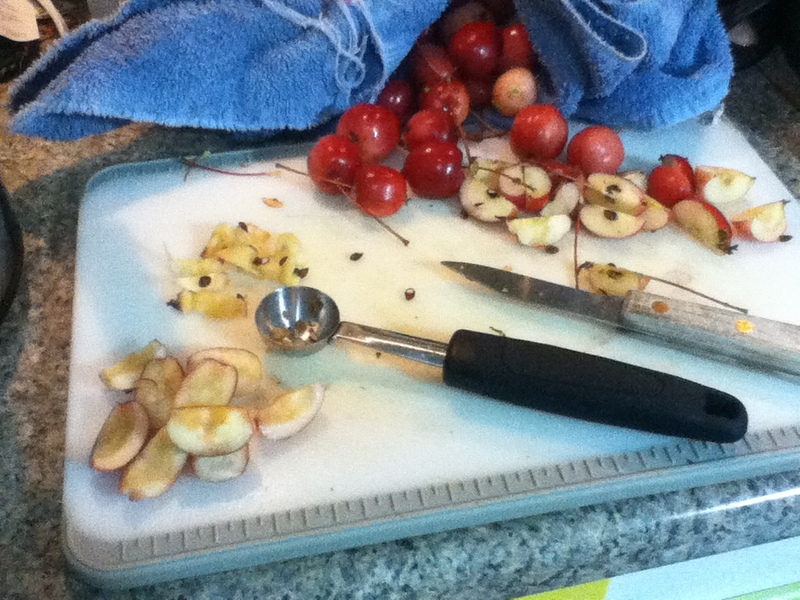 The 7-ish pounds of apples took me 3 and a half hours to core. 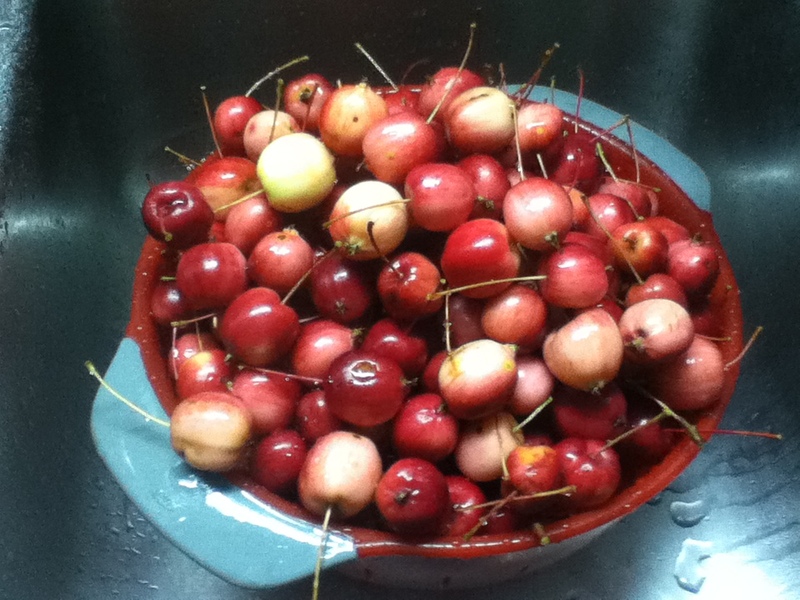 Here are all the crab apples plus two ginger golds I had sitting around. 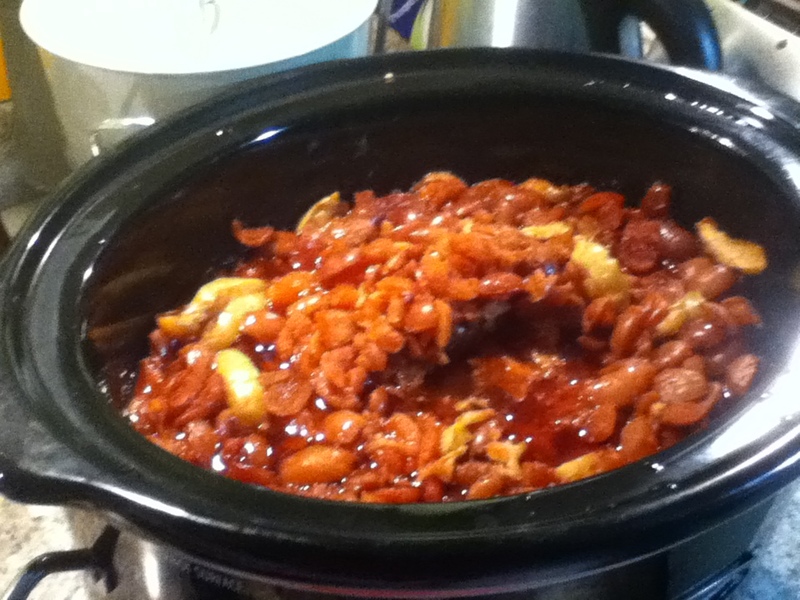 I set the slow cooker to the low setting and left it over night. Here are those apples the next morning- very well cooked. I hit them with a hand blender to get a smooth paste. The peels disappeared. So glad I didn’t waste time with a peeler! 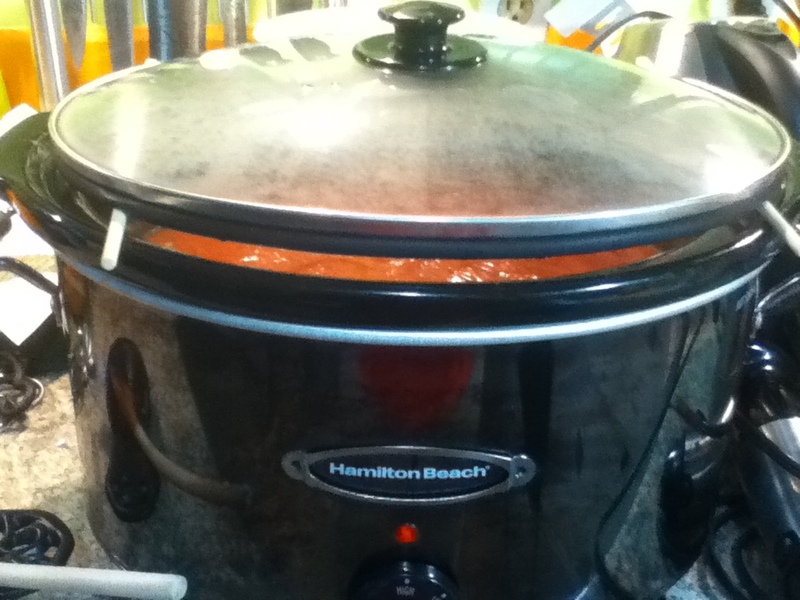 I used chopsticks to elevate the cooker’s lid and set the temperature to high. I added just half a cup of brown sugar and a tablespoon of vinegar to offset the astringency. I also added the spices at this point. 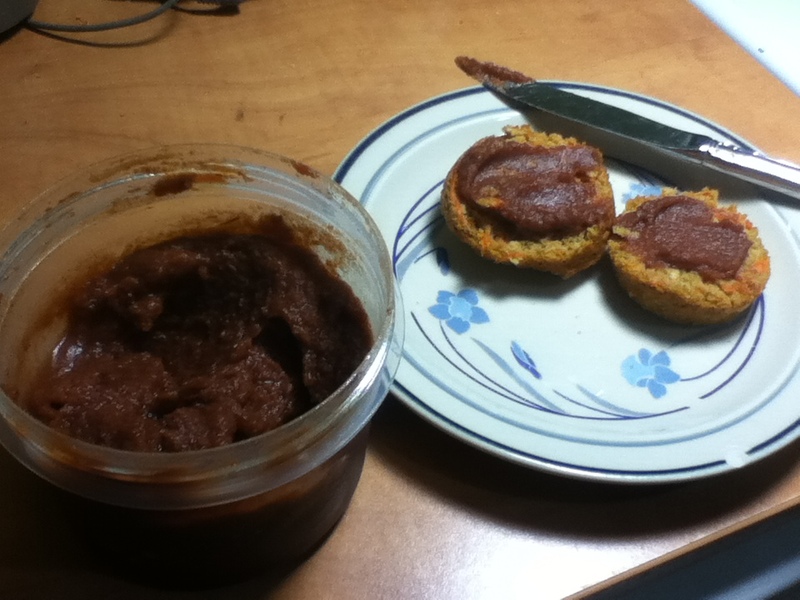 After three-or-so hours the apple puree was reduced to a delectable paste. It goes perfectly with carrot oatmeal muffins, as demonstrated here. The crabapple butter is delicious-not too sweet, pleasantly bitter, and just spicy enough. Honestly, the yield was not sufficient enough to warrant digging out the canning equipment. I put the final product into plastic storage containers, kept one in the fridge and the rest in the freezer. Not bad for essentially free food, I’d say.